You will find no worksheets in our classrooms – we believe children learn best when they create their work through using their own imaginations. Children learn by exploring, by playing, and yes, even by getting dirty! We are here to guide them as they learn through the experiences and materials we prepare for them each day. We are here to guide your child and foster a lifelong love of learning and adventure. Galaxy Ranch Private School offers an experienced staff, private kindergarten and an excellent age-appropriate curriculum in all our classrooms. Our facilities are first-rate with each classroom having a private restroom. Children enjoy a large gym for indoor play and custom private playgrounds designed for different ages for outside play. Preschoolers have a chance to garden in our raised gardening beds. Our unique valet service offers parents the opportunity to drop off and pickup children at the front of our building without ever having to leave their car. We welcome your child, get them out of the car and get them to class with a smile. At the end of the day, we walk them out and buckle them in so you can be on your way. 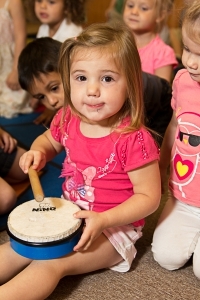 In addition to our exceptional preschool curriculum, children in Preschool 2 and older enjoy weekly Music and Spanish classes. Galaxy Ranch Private School also offers a variety of additional parent pay options for children to enjoy during their day such as specialized swim classes, computer classes, dance, TOTs, and Stretch ‘n Grow. In addition to our outstanding preschool curriculum, children in Preschool 2 and older enjoy weekly Music and Spanish classes. Blue Ivey also offers a variety of additional parent pay options for children to enjoy during their day such as computer classes, dance, TOTs and Stretch ‘n Grow. Studies have put the financial benefit of an early childhood education at anywhere from $8 to $17 for every dollar invested. Attending a quality preschool affords children the opportunity to reap long-term benefits in every aspect of life. Studies have shown these children to be more successful in developing social and interpersonal relationships and even enjoying a higher success rate in marriage. According to the National Institute for Early Education Research attending a full-day preschool program resulted in better outcomes in mathematics and literacy tests through the end of first grade.